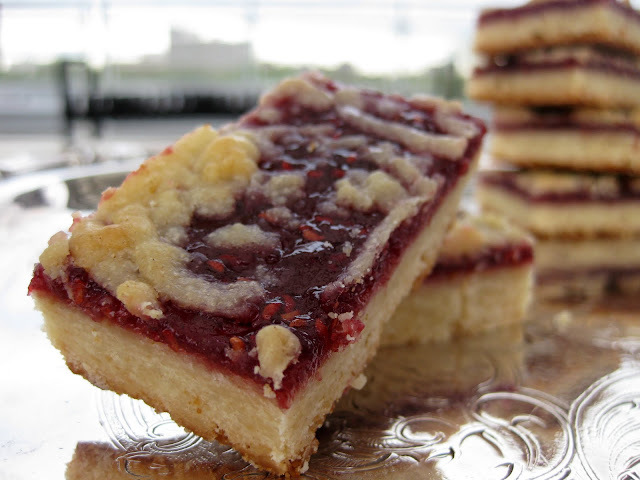 These delicious raspberry shortbread cookies are certainly worth a few words and pictures. I can't share the recipe for these wonderful shortbread bars with you here, but I'm happy to show you the end product! If only you could taste it, too! To do that, you'll have to get a copy of Joanne Chang's recent (and excellent) cookbook, Flour: Spectacular Recipes from Boston's Flour Bakery + Cafe . I can, however, share my experience making (and eating) these delights, and I provide a few tips I learned along the way. 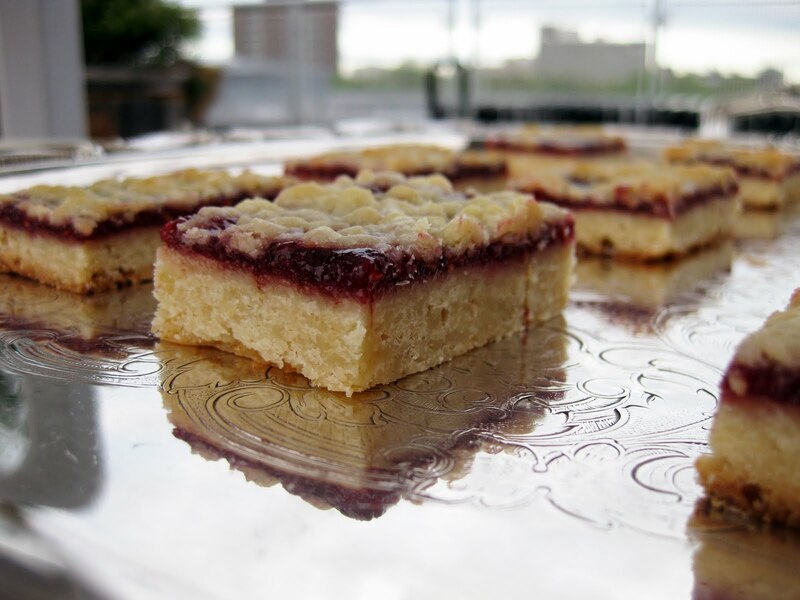 This raspberry bars recipe is delicious! Hats off to Joanne Chang! "Spectacular" pretty much sums up Joanne Chang's Raspberry Crumb Bars. Straight out of the pan, they're already towering above the quotidian cookie in terms of taste and presentation. To pump up the fancy, you can dust them with powdered sugar right before serving. A silver tray doesn't hurt, either. 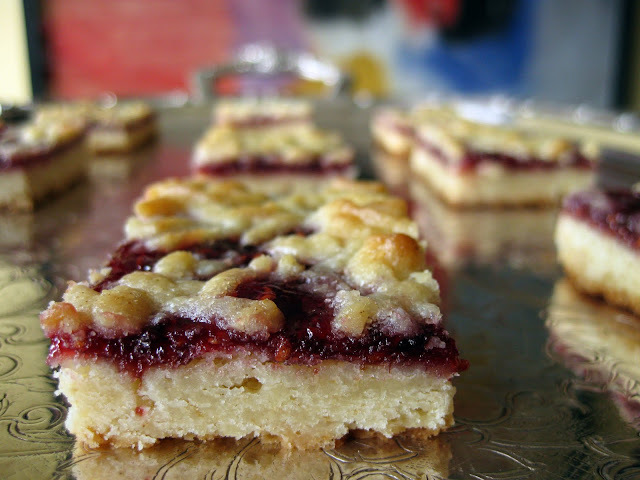 The browned top of a delicious raspberry bar. The star of the ensemble is the shortbread bar base. Buttery and golden, it is the product of Joanne's own expert know-how and her early experiences working for pastry chef Rick Katz. A heaping quantity of raspberry jam spread over the raspberry bar cookies adds a beautiful ruby layer and bright contrasting flavor. 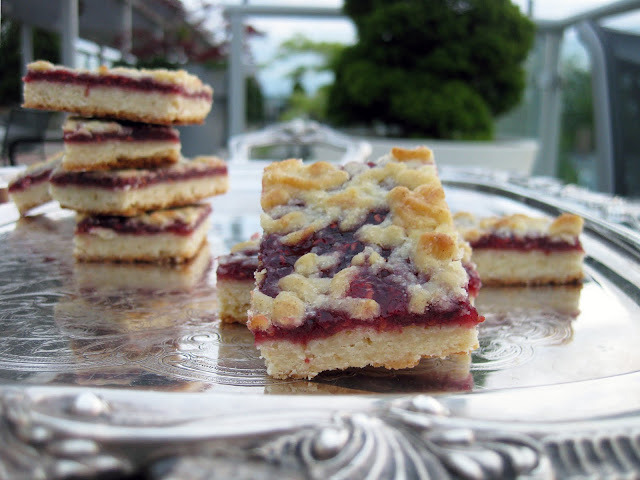 Top the gem-like raspberry layer with shortbread crumbles, and you truly have something to look forward to once they cool. Boston's Flour Bakery serves up this delicious raspberry bars recipe, which you can now make at home thanks to Joanne's great cookbook. If you make these delicious raspberry crumb bars, here's a tip: At one point, the recipe asks you to roll the shortbread bar dough into a 9x13 inch rectangle. Do your best freehand, and then use this trick: take a 9x13 inch pan, flip it over, and use it like a huge cookie cutter to gently press down and find the rectangle boundaries. Cut off the excess dough and press it into the areas that are lacking. Smooth it out again with a rolling pin. Nice trick! This looks so good and I can not wait to make this.